Chris has been an ordained pastor since 1992. Chris attended college at the University of North Carolina at Charlotte where he received a BA in Psychology. He went on to attend seminary at the Divinity School at Vanderbilt University and received his Master of Divinity degree. Chris has pastored in several churches both in Tennessee and North Carolina and has also been deeply involved in Hospice Chaplaincy. Chris and Ronda live in Burlington and have five children. Ronda is employed by Registry Partners Incorporated in Burlington. Shannon and her family moved to this area in 2007 from Henderson County, North Carolina. Shannon has served on staff at Mt. Carmel Baptist Church in Chapel Hill, West Hendersonville Baptist Church, French Broad Baptist Church (Hendersonville) and Lakeview Baptist Church in New Orleans, Louisiana. Shannon received a BA in English and a minor in music from Converse College in Spartanburg, SC. She is married to David Hall who teaches middle school science at Gravelly Hill Middle School in Orange County. Both Shannon and David attended the Baptist Theological Seminary in New Orleans where Shannon received a master’s degree in Christian Education and David a master of divinity degree. 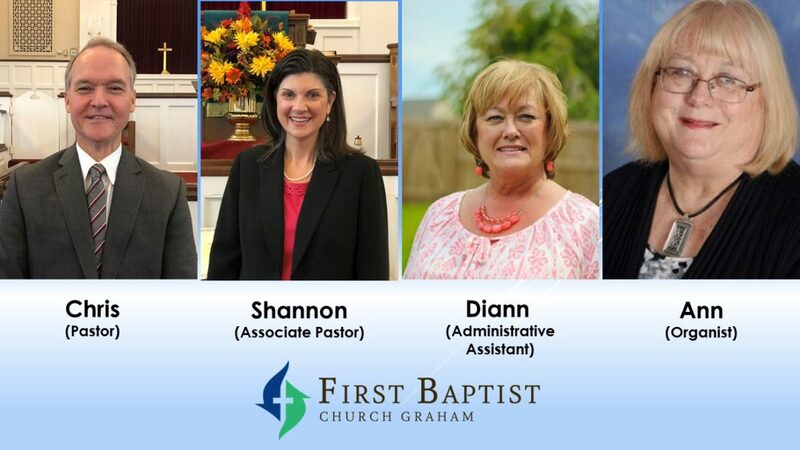 Shannon was ordained by First Baptist Church of Graham in June of 2010. She and David have three children: Jonathan, Chloe, and Caroline. They live in Mebane. Ann has been our organist since March 2012. She is a graduate of Meredith College with a degree in Church Music, with a minor in Organ Performance. She was the Music Minister at FBCGraham from 1994 to 2007, and before that served as Minister of Music at Hocutt Memorial Baptist in Burlington, NC, Director of Music and Youth at Highland Baptist in Garner, NC, and Organist at West Raleigh Presbyterian in Raleigh, NC. She recently retired as a private piano teacher for over 35 years. She is married to Steve Holt, and has 3 grown children, Kathryn, Scott and Tom, and 3 perfect grandchildren, Logan, Kathleen and Olivia. Her go to verse in the Bible is James 1: 2-6. Diann has been on staff since June 2017. Diann was born and raised in Alamance County. Her husband is Jamie Clapp and they live in Mebane. They have a daughter Jessica, and a granddaughter Hailey. Her family attends Integrity Church and they are involved in several ministries. Diann enjoys spending time with her family, reading and gardening.